To say these kits are cute is an understatement. They are fourteen adorable little bouncing balls of fur. Four of the fourteen are all white, and I think they might be the absolute cutest of them all. These have been outside since birth, so I’m not able to peek in on them as often as I did the last litter that was inside. For that reason, they haven’t been held as much and you can really tell. They are just 3 weeks old, but already they don’t like to be picked up at all. They scream and kick their little feet — much like a toddler pitching a fit. And that’s assuming you can even catch them. 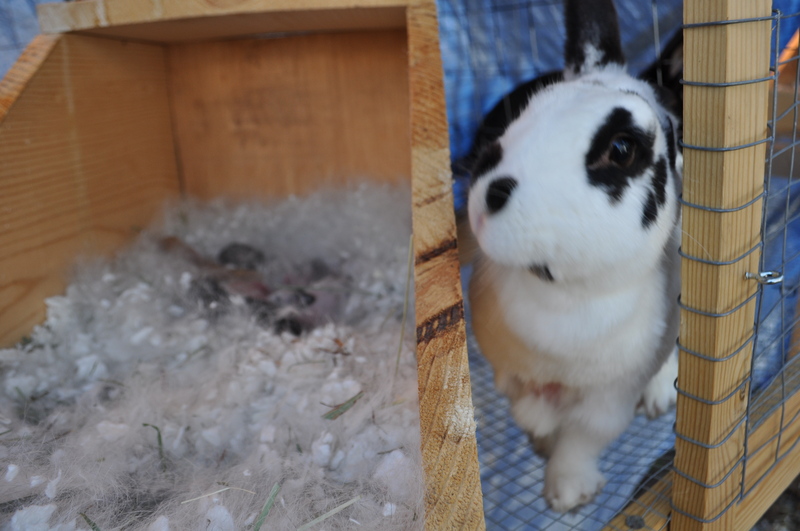 We have a 12′ long cage that is divided down the middle — 1/2 for each mama. Well, the babies are still small enough to run between the fence dividing the halves, so as soon as we try to grab them from one side they have run to the other side. We have learned to be a little sneaky and bribe them with Timothy hay. 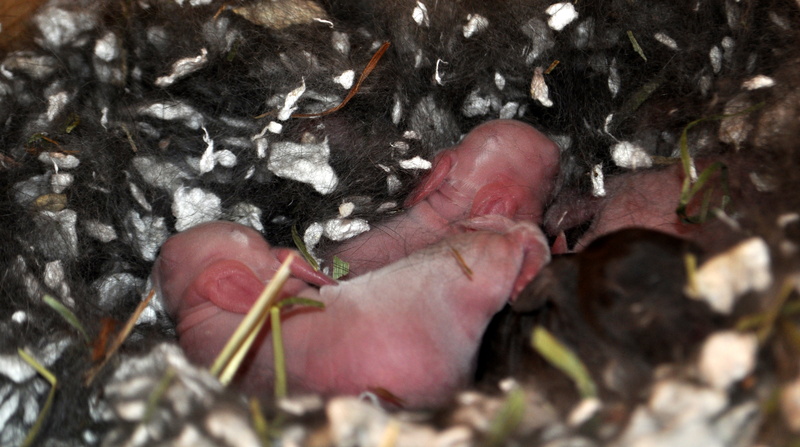 At 3 weeks old though, the litter from the black/red mama (Phoenix) weighs an average of 13-1/2 ounces. That is a whole 5 ounces larger at this age than our first litter from the broken mama (Aries). I’m sure this is due mostly to the fact that Phoenix is quite a bit bigger than Aeries. However, the kits from Aries are also bigger this time by several ounces on average. I’m guessing that could be from having a smaller litter to nurse (7 vs 10). 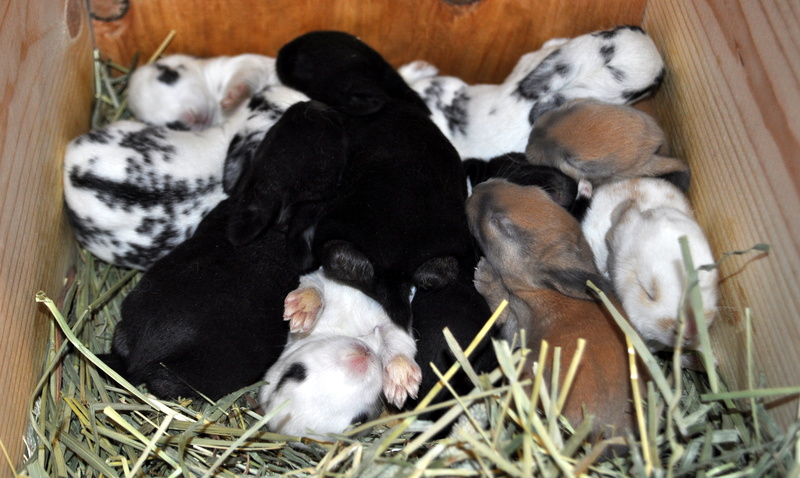 Or maybe first litters are, on average, just smaller. I’m really not sure. It hadn’t been all easy going though. At 1 week old, one got stuck in the corner between the wire and the frame. I had to get my grandkid’s mother (size zero) to climb in the cage to get him out. Sure wish I had a picture to share as it was quite funny looking. That issue has been fixed. Another one just plain fell out of the cage. Not sure how, but we’re thinking the door opened just slightly and he just plopped out of the cage. I found him early the next morning just sitting there on the ground, and I’m so glad I found him before the dogs did. That problem with the cage has been fixed as well. However, they like to lay in a big pile next to the door, so there have been several times now that when we open the door, no matter how careful we are, one will fall out or jump out. 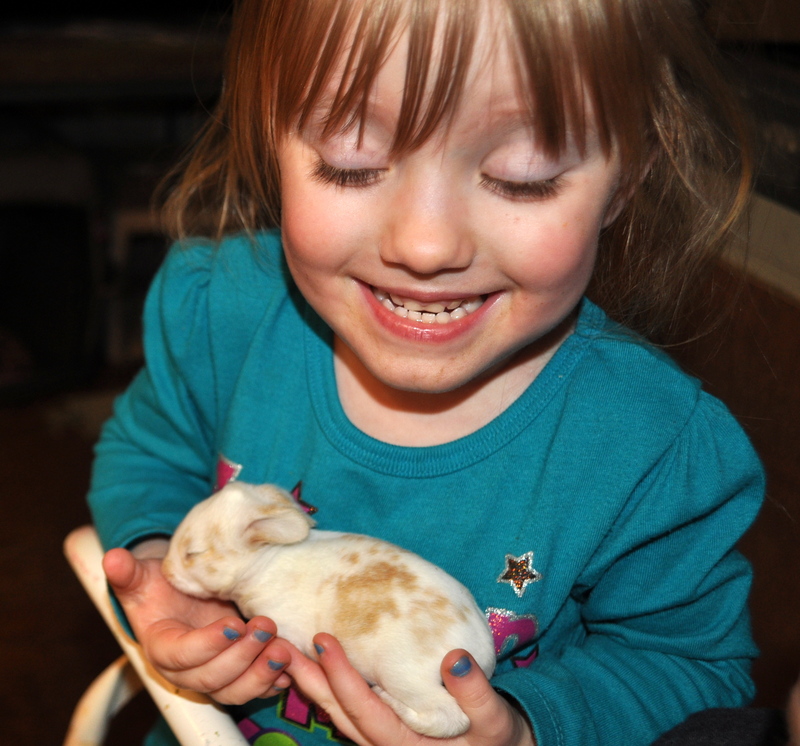 So on any given day now you may find us chasing a baby bunny through the yard. In fact, between the bunnies and the chickens, I’ve been chasing quite a few animals lately. Thankfully, though, I have been able to catch each one of them and get them safely back to their little homes. 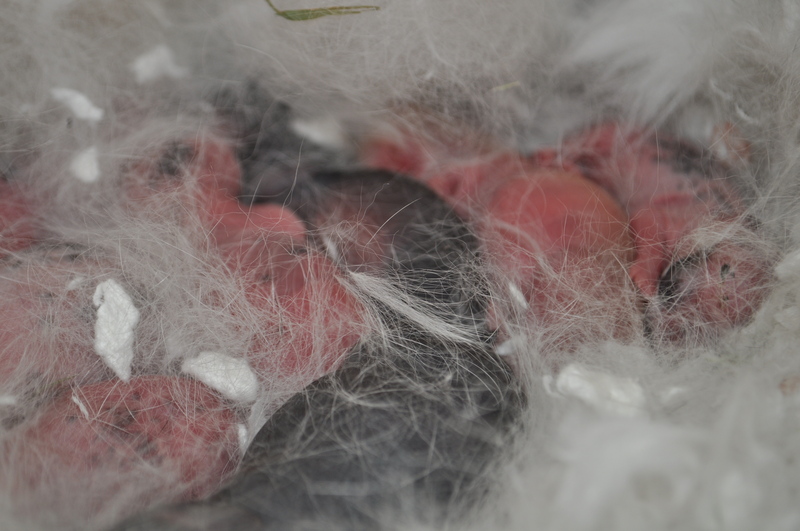 Overall, all 14 kits are growing and developing quite perfectly. 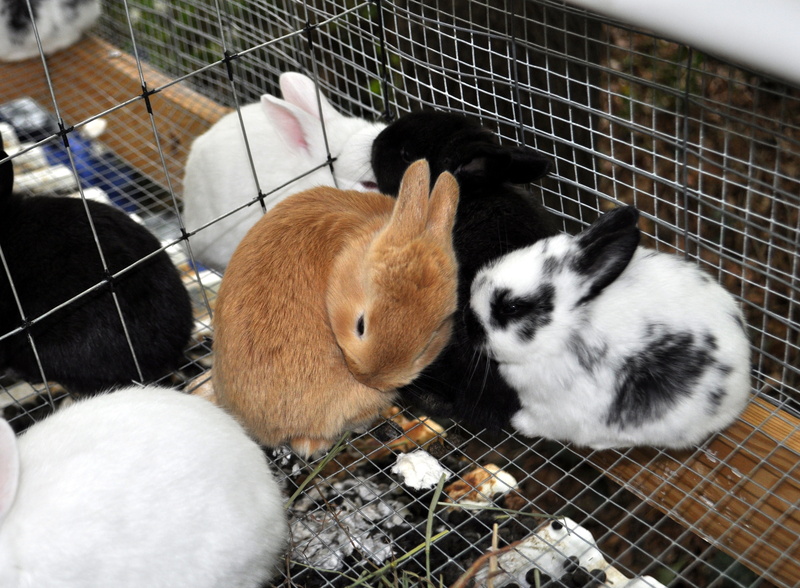 Our first litter of kits was just 3 months ago and it has been a ton of fun to watch these cuties grow. Already we’re planning when we might breed our third female — you remember, the one we got in trade that was supposed to be a male… Chances are I’ll be showing you pictures of her cute babies in about 6 weeks. I think this light red one is really cute a well. 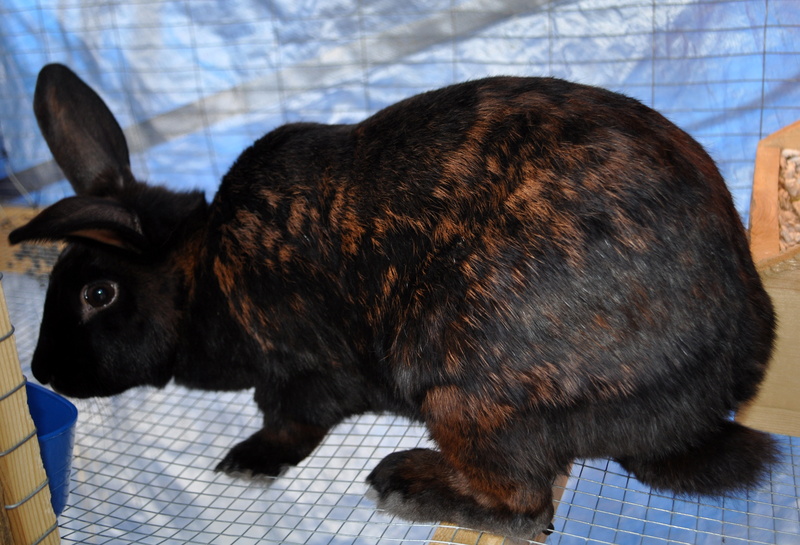 His undercoat is white, versus the dark undercoat of the other two red ones..
It’s been a while since I’ve posted. When you’re working 70-hours a week it’s hard to find time to fit anything else in. I did find time to make a bow tie and suspenders for monkey #2 for his aunt’s wedding that he is in this weekend (Pictures in a post later this weekend). 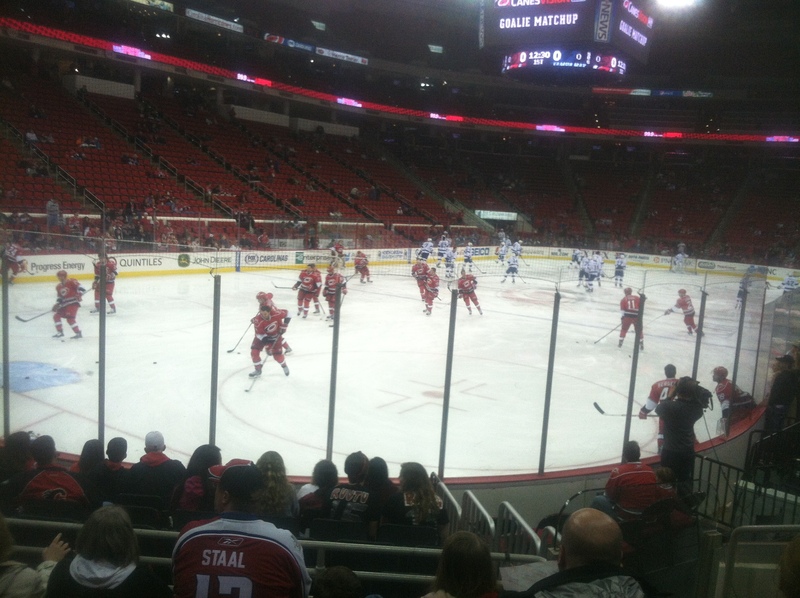 And I made it to a hockey game this week, so that was a much needed rest even if my team did lose. But the real news this week is more new kits. We woke up Easter morning to this. It’s kind of like Christmas morning. You know there is something there to be unwrapped, but you’re not sure what it is (or in this case, how many) until you dig deeper. It was still pretty early in the morning and quite cold, so I left them alone until mid-day and then decided to dig down to see. And I found this. There were actually 8 little ones, but one was dead. The other 7 were very active and squirming all over the place. Here is the proud mama. She is very wary of me and wonders what I’m doing messing with her babies. 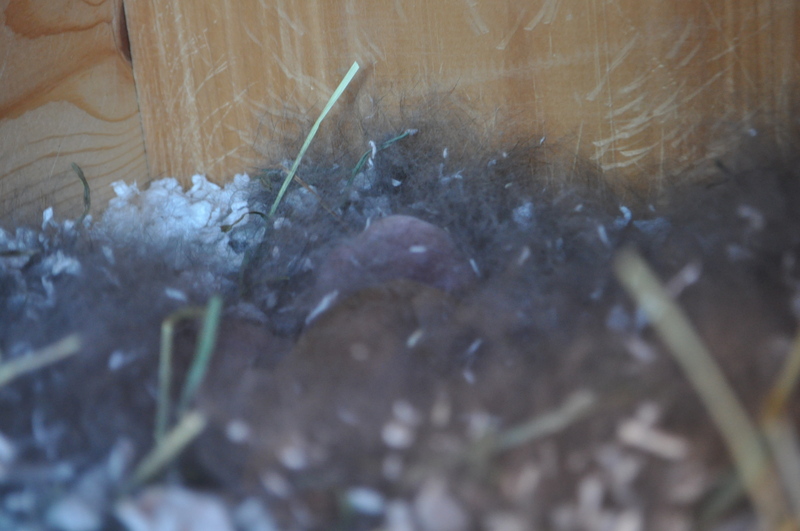 Then three days later, we woke up and our broken female was pulling fur like crazy. She was a day late to deliver so we were already wondering if she was really pregnant or not. She is the same female that had our last litter and she doesn’t get real big. 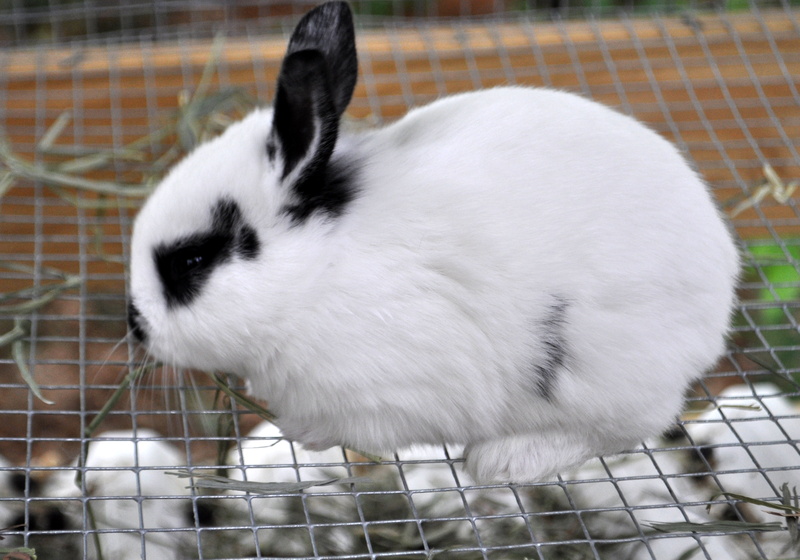 And I still haven’t figured out how to tell if a female rabbit is pregnant by feeling for lumps at 10-14 days gestation. So, even though we bred them on purpose and counted down the 31-days to delivery, we were still uncertain if she was even pregnant. From what I hear breeding isn’t always successful. Here is mama looking on while I check out her babies. She is probably a little more trusting of us since she is the mama from our first litter. 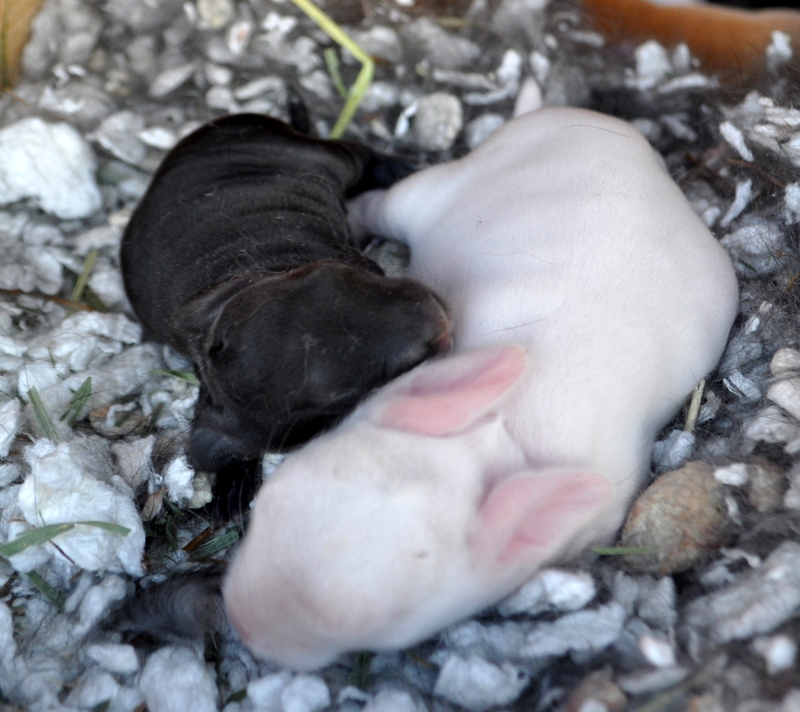 Here is a picture of one of each litter taken today — one is two days old and the other is 5 days old. It shows just how much they grow in just a few days. It’s amazing. Update on the first litter we had in January — we still have 4 left from a litter of 10. We sold 5 to homes looking for a pet. And one male we traded for another male to someone else looking to diversify their gene pool. I thought it was a great idea, so I was all for it. About a week later, honeyman mentioned that he had put the new male with our other male for a few minutes because he wanted to see how they would get along. But he said that our male just kept trying to hump the new one. I thought that was strange. I mean male dogs hump each other, but do male rabbits? So, I asked, “You did check to make sure it was a male that we got in trade, didn’t you?” Well, he hadn’t so we decided to check right then. And I bet you can guess what we found before I even tell you. It wasn’t a male after all, but a female that we had gotten in trade. The man who traded with us also said he (she) was 9-months old, but I’m not sure how to tell the age of a rabbit, so I’m not sure about that either. I guess we’ll try to breed her one day and see how it turns out. Honeyman said they didn’t actually mate that day he put them together. Maybe I better count down the 31-days just to make sure. Otherwise, I guess it’s a lesson learned. But, here are our 4 remaining from the first litter. They are about 9-1/2 weeks old and approximately 4 pounds. We are keeping the white and brown one. 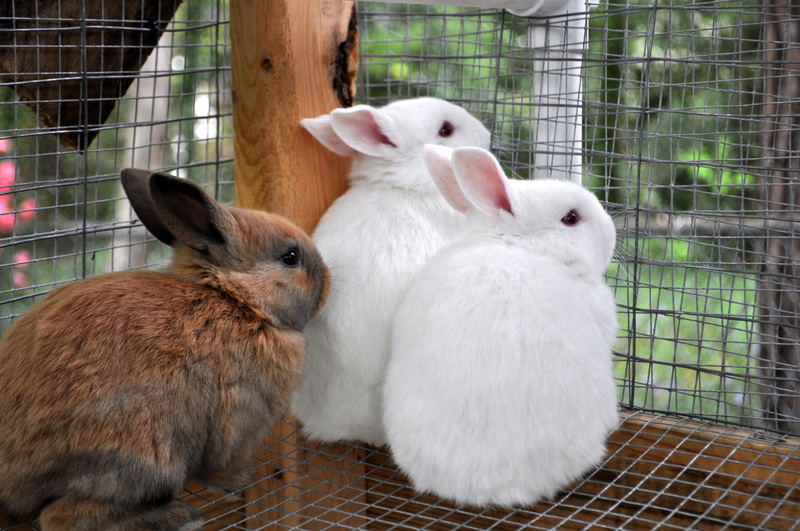 The others are… well they are very close to eating size if they don’t get sold in the next couple of weeks. Back to work. Thankfully, April 15th is almost here. The kits are 5 weeks old, today. 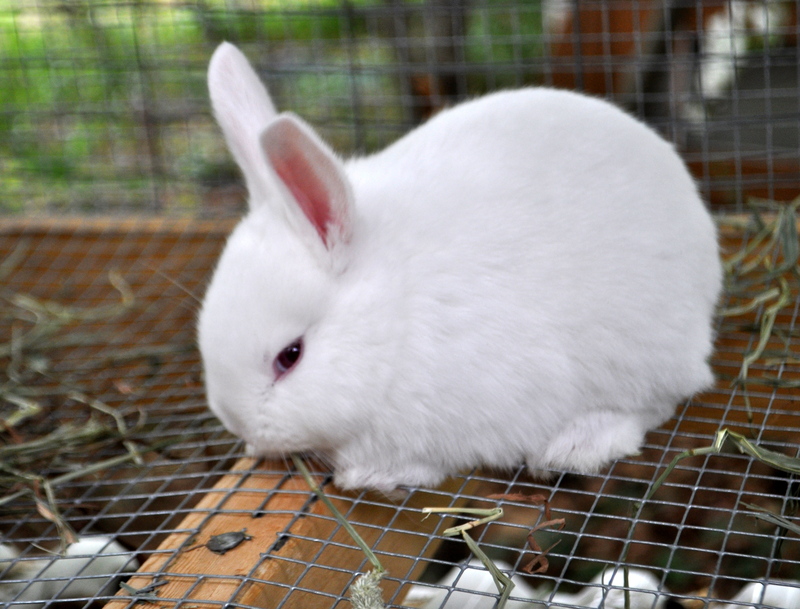 For meat rabbits, they should be 1-1/2 pounds by now. And they are very close. They weigh between 1 pound 4 ounces and 1 pound 7 ounces. They are eating about 100% pellets and hay now. We still put the mom with them once a day to nurse them, but she only nurses for about 5 minutes max and then she’s done. So, it’s probably time to start weaning them. We also re-bred the mom this past weekend, so hopefully she’ll be having another liter in 4 weeks. 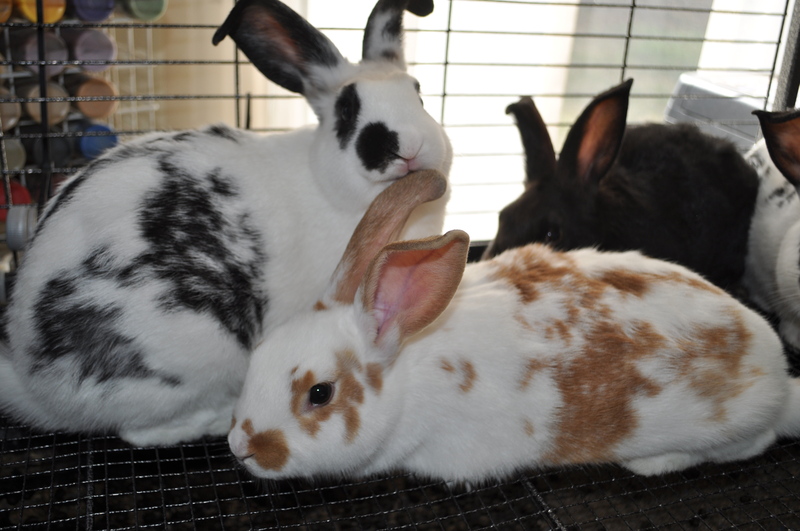 We have 3 females and 7 males. It surprises me that the split between male and female is not more even. I”m not sure if this is normal or not. I believe we are going to keep the white and brown female. So, I broke rule #1 and got attached. 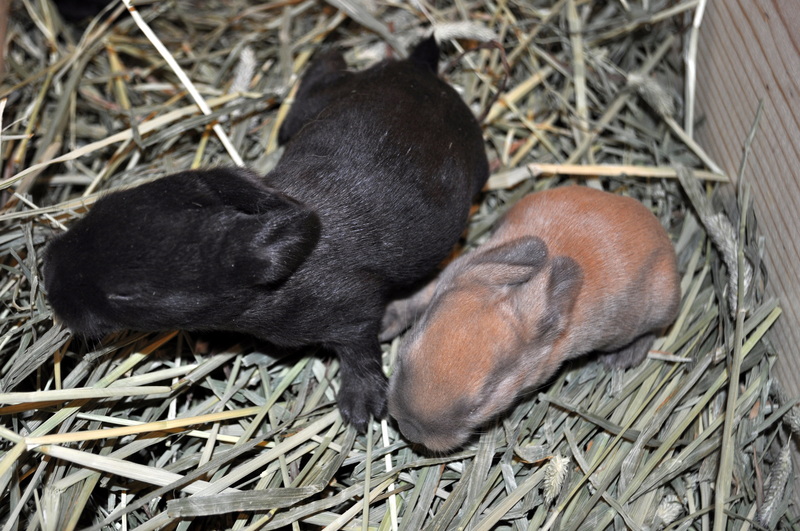 The runt of the litter – the small brown one — is the sweetest little bunny. 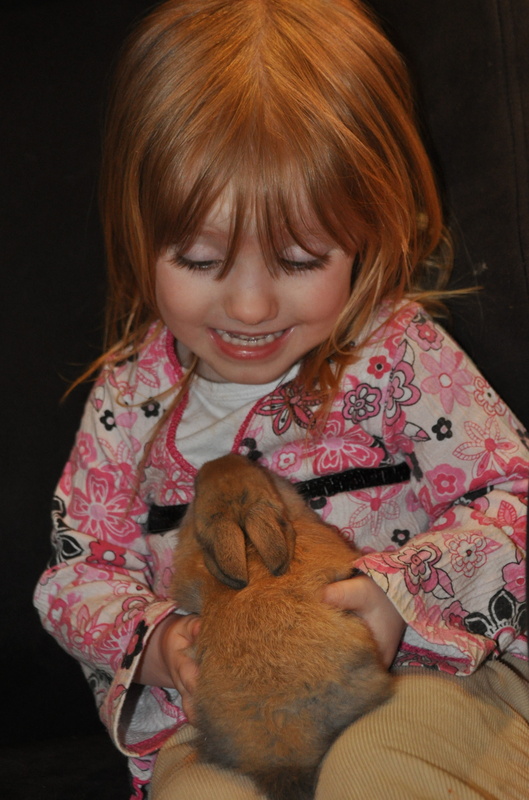 My 3 year old grand daughter plays with him often and he lets her hold him all sorts of ways, and he doesn’t care. He doesn’t kick if she doesn’t hold his hind legs. It’s amazing. We hadn’t planned on keeping a male, so I’m trying to find him a home. If we can’t find a home for him, we’ll likely keep him too. I also made them some organic snacks. They love them. We turned 10-days old today. Several of us have just started opening our eyes and are starting to wonder about the world around us. We have also recently discovered that the timothy hay our bed is made out of is pretty yummy. Sleep a few winks, munch a little, sleep a little more, munch a little more… It’s a great life! Our legs have got this twitch to them. Our human mommy thinks we’re spazzing out, but really we’re just trying to get our hind legs moving so we can be jumping around soon. So, how big are we now? Well, you met me (the black one) almost a week ago when I was 3.0 ounces. Now I weigh 5.5 ounces. My brother/sister beside me in this picture is the smallest of our litter. She/He weighs just 3.8 ounces now. The others are all somewhere in between. So there is a pretty big difference between us. But, we all love each other and still love to cuddle and sleep together.